Often an accomplishment that’s difficult to achieve, a good night’s sleep plays a vital role in your health and wellbeing. From your physical and mental health, quality of life and everything in between, a proper night’s rest each and every night is something we should all hope to attain. While you’re sleeping, your body is working to support healthy brain function, and is actually preparing for the next day, forming new pathways that will help you learn and retain information. 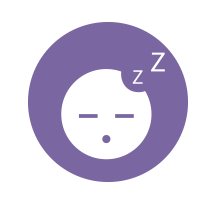 Many studies have come to the conclusion that sleeping well improves learning – whether it be in the classroom, at work, or even in the gym – and facilitates problem solving skills, decision making and creativity. Healthy sleep also results in the healing and repairing of your heart and blood vessels, in addition to maintaining healthy hormone balance. That being said, with the right prep, a good night’s sleep shouldn’t be just a dream. A question asked by many. Unfortunately, there is no one answer as everyone’s sleep needs vary. However, there are some good indicators that can act as a guideline for most people. Generally, healthy adults can function for 16 hours of wakefulness and therefore require 8 hours of slumber. On the other hand, there are individuals who are able to operate on as little as 6 hours of sleep without reaching for an espresso shot. Towards the opposite end of the spectrum are those who require 10 hours of sleep (must be nice!) to perform at their peak. And despite what you may have heard, the need for sleep does not decline the older you get, but the ability to sleep 6-8 hours at one time may be reduced. So, the key is finding your sweet spot of time spent under the covers and doing your best to be consistent. There are simple techniques to help you sleep better and in turn, reap the physical and mental benefits that come with a good night’s rest. Adult Essentials Melatonin Sleep Aid is specifically designed to help increase sleep time and quality in those with altered sleep schedules (like sleep restriction, jet lag or shift work), something your brain and body will thank you for. They have all the great benefits of a natural sleep aid. Uniquely designed in a great tasting, easy to chew, pectin-based gummy, this Night Time Sleep Aid is guaranteed dairy, gluten and nut free, with no artificial sweeteners, flavours or colours. Adult Essentials Gummies are 100% licensed and approved by Health Canada.